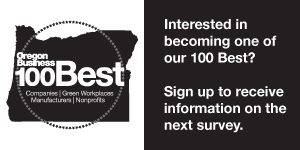 More than 5,000 employees and volunteers took part in this year’s 100 Best Nonprofits to Work For in Oregon survey. Since the tally came in, there has been is no shortage of speculation about the impact of Brexit on everything from the stock market and the global economy to the future of British expats living in other European countries. Oregon might seem far removed from the EU shakedown. But in a globalized world, we are not as immune as we think. Here are four signs of Brexit in Oregon. More than 15,000 employees and volunteers from the for-profit and nonprofit sectors took part in this year’s 100 Best Green Workplaces in Oregon survey. It's widely recognized that there are two Oregons: one centered on the Portland metropolitan area and another composed of the state’s smaller cities and rural areas. Democratic presidential candidate Sen. Bernie Sanders will host a campaign rally today at the Salem Armory Auditorium. Sanders is expected to give his stump speech, discussing the influence of money in politics, making public colleges tuition-free, fighting climate change and implementing universal health care. The candidate is trailing former Secretary of State Hillary Clinton in the race to claim the Democratic nomination. Despite that, Sanders is posturing strongly in Oregon. The Salem rally will be his fourth campaign stop in the Beaver State — Hillary Clinton has not yet visited. It's an ideal industrial site for a municipal port looking to expand: 30 acres of paved tarmac, five concrete piers, warehouses, hangers, and a deep-water channel that leads straight to the Columbia River. You know the pendulum has swung when the government is backing loans that banks won’t touch.